Club River presents summer version of club Cinema and proudly you can say one of most famous and most popular places in Belgrade. 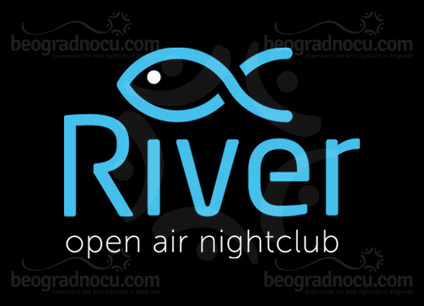 Club River is located in the most popular place for summer fun in Belgrade, on Sava quay in Brodarska bb Street, between Old Railway bridge and bridge Gazela. In club River guests are some of the most popular names in pop and folk domestic music scene. Like Mira Škorić, Seka Aleksić, Dara Bubamara, Željko Vasić, Šako Polumenta, and many others. Club River works five days a week: Monday, Wednesday, Friday, Saturday and Sunday. Program is various, starting from pop to folk music and all kind of RnB sounds, therefore it is on top of nightlife in Belgrade. Interior of club River is conceived so good that all of the seats are interconnected, that gives this place a certain charm and a dose of originality. Club River is designed so there is no bad place inside. Whether you are at the bar, bar table, high seasting or a booth, you are always in center of attention, what makes a nightlife unforgettable wherever you find yourself. Lighting and sound systems are high quality. You can find all kinds of drinks, from great cocktails to most exclusive champagnes. With all of the above, and very professional and polite staff, this certainly makes nightlife at club River unforgettable. Due to the large popularity and great attendance that this place has, you have to make reservation a day or two before. Especially on Wednesday and Friday witch are trade mark of club River.